Definition at line 24 of file ZYppFactory.h. Definition at line 327 of file ZYppFactory.cc. 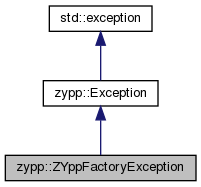 Definition at line 333 of file ZYppFactory.cc. Definition at line 30 of file ZYppFactory.h. Definition at line 31 of file ZYppFactory.h. Definition at line 33 of file ZYppFactory.h. Definition at line 34 of file ZYppFactory.h.